General multiport mode: the suitable S-parameters (e.g. S21) of the matched system are optimized. This mode is used for filters, amplifiers, near field communication, wireless charging etc. In the antenna mode you can specify targets for the isolation between the antennas and in the general multiport mode you can specify stop band criteria for any of the S parameters. In both modes some of the ports can be shorted to the ground through an optimized matching circuits. The simultaneous multiport matching is a much more complex matching problem than the single port matching especially if there is high coupling between the ports of the unmatched system. In general, the matching of all ports needs to be optimized at the same time. Optenni Lab's multiport module provides fast parallelized multiport matching and automatic or manual topology creation for all ports. The component libraries of Optenni Lab and the tolerance analysis are fully supported by the multiport module. The worst-case isolation between two antennas can be examined using the electromagnetic isolation tool in Optenni Lab. MIMO antenna matching: simultaneous matching of MIMO or diversity antennas, taking into account the coupling between the antennas. The system is optimized for best possible efficiency, not for best possible impedance match. Near field communication and wireless charging: in near field communcation (NFC) and wireless charging applications the matching of both the receive and transmit coils (antennas) need to be simultaneously matched for optimial transfer of power. 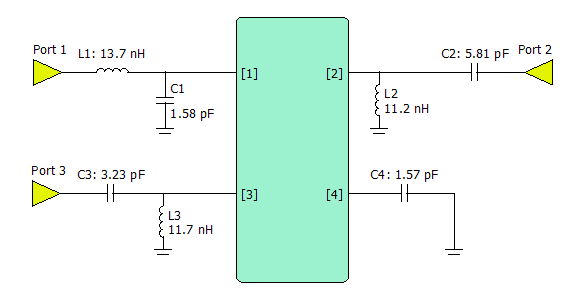 Filter design: with some starting filter configuration it is easy to optimize the filter behaviour on pass bands and on stop bands. Simultaneous input and output matching of amplifiers: an amplifier can be matched over a given frequency band so that maximal gain is obtained. This results in a good input and output match. The matching can be optimized with respect to any complex frequency-dependent load, not just to 50 Ohms. Setting up the multiport optimization for antennas: just click on the ports to set the operation frequencies and on the circuits to set the number of components (for automatic topology creation) or the topology to be optimized. 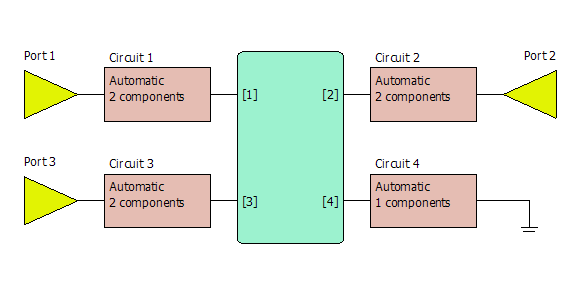 Example of an optimized matching circuit for the simultaneous multiport matching. The Optenni Lab multiport module supports an arbitrary number of ports. Any of the ports can be terminated with a matching circuit and then grounded. An example of an optimized four-port system with attached matching circuits and one grounded port. With the Optenni Lab multiport module you can obtain optimized multiport matching circuits using the correct optimization criteria within a matter of minutes.